Grupo de Teatro Índigo (GTI) is an organization founded by Eddie Gonzalez and Domingo Banda. The main objective GTI has is to always give diverse members in the community of Houston who are interested in the performing arts a space where they can have the opportunity to demonstrate their talent through different theatrical presentations this organization produces. GTI opens the doors to all those who wish to achieve their goals in the arts, through their strong effort and dedication. The organization has an extensive theatrical repertoire where they incorporate different social issues, such as racism, domestic violence, and gender discrimination, to name a few. They debuted in 2007 with their first original play, “Indigo”, a story in which they exposed discrimination and racism towards different ethnic groups during the year 1845. This production was presented four times in two consecutive years with the aim of raising funds for the Catholic organization “Encuentros de Promoción Juvenil” (EPJ). “La Cape” (2009), a satire of Little Red Riding Hood that mocks the Mexican double entendre way of speaking, was presented at MECA. “The Wife That Never Was” (2010), touches the issues of psychological disorders such as bipolarity and schizophrenia. This tragicomedy production was presented for a month at Centro Latino of the Performing Arts in both English and Spanish. It was produced again in 2012 at Talento Bilingue de Houston (TBH), and upon the public’s request, it was brought back in 2014. “Abuso” (2010), is a theatrical play that wants to educate the viewers about domestic violence; the original play even has its own musical theme (of the same name). It was presented at the Centro Latino of the Performing Arts and Midtown Art Center (2012). “Estigma Seropositivo” (2012), was presented with the main purpose to educate the community about the stigma and discrimination that surrounds people diagnosed with HIV. The project has been presented with the support of the Fundación Latinoamericana de Acción Social (FLAS), in different national HIV conferences, Crystal Club, Lonestar University, Health Fairs, and the Consulate of Mexico. Thanks to this theatrical play, FLAS and GTI unite their talent to collaborate and create “FlasNovelas” (2015) a project of 10 episodes, which were transmitted in a series format over the internet (web series). We had the honor to count with the participation of the Mexican singer and actress, Irma Infante, daughter of the late idol Pedro Infante. FlasNovelas has been taken to several national conferences due to its various content of the stories it represents on HIV, drug addiction, abuse, LGBT community, to name a few. “Prejuicio” (2014), shows the lack of acceptance and support that exists towards the LGBT community. The presentations took place in different venues, like Midtown Art Center, Viviana’s Night Club, and various community centers. “Calavera con Calavera” (2014), in its fourth consecutive year in theaters, the story invites the public to learn the history of the Burgos family, and as the play develops it shares the symbolism and traditions that revolve around the traditional Mexican celebration of Day of the Dead. The theatrical play has been presented at Midtown Art Center, Talento Bilingue de Houston, General Consulate of Mexico in Houston, at an Elementary school, and a short version at various festivals. In this production, they have had the honor to have the presence of the Mexican comedian, Nora Velázquez, who is famous for her key character “Chabela”. The Hollywood actress, Vanessa Vásquez, also accompanied GTI to one of the presentations. “Doña Bárbara” (2016), an adaptation of the Venezuelan novel by Rómulo Gallegos, was presented at Obsidian Theater, Plaza Americas, and TBH Center. Grupo de Teatro Índigo is characterized by presenting innovative theatrical plays with original content created by the writer and producer, Eddie González. 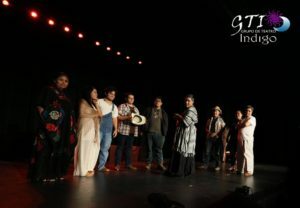 GTI has always distinguished itself for producing theatrical plays with current issues where not only they invite the public to have a pleasant time, but to also to reflect on the different social, psychological, and emotional situations through which the characters of the stories are presented.